Single-minded, controversial, visionary. All of these things and more are true of the man who’s been at the helm of Gibson for more than 30 years, Henry Juszkiewicz. Now, as the company stands at a historic crossroads, after filing for Chapter 11 bankruptcy, we join him for an exclusive interview in which he talks frankly about Gibson’ s guitar-making future - and the twilight of his reign at the company. There was, for many, a sense of the inevitable when news broke that Gibson were filing for Chapter 11 bankruptcy to protect creditors while it restructures the business. For critics of the company, it was a long-prophesied day. Keyboard warriors everywhere took to forums and Facebook to rail against what they perceived as a self-inflicted injury. Gibson’s 2015 product line came in for particularly heavy flak. Intended to encourage new players to the brand, Gibson USA’s 2015 electrics sported an automatic-tuning system, wider necks and a brass nut - non-traditional features that were intended to make playing easier. For many among the Gibson faithful, however, the modifications were akin to putting a baseball cap and sneakers on Michelangelo’s David. The ensuing backlash cast a shadow over all that the company tried to achieve in the months that followed. The strength of that backlash is explained, in part, by the raw emotional power of the company’s heritage. Somewhere in the heart of every guitarist there is a little piece of hallowed turf that belongs to Gibson. If you grew up playing guitar at any time between the 1950s and the 1990s something special happened when you saw a Gibson in a shop window. The act of owning a Gibson for the first time seemed both a rite of passage and a long-awaited arrival at a longed-for place. Guitar’s biggest heroes played Gibsons, classic records were defined by the sound of PAFs screaming angelically through Marshall stacks - while the guitars themselves possessed an intoxicating blend of elegant form and potent function. Gibsons were always a little more expensive than the guitars of other brands - but that only made them the more desirable. It is, arguably, that very love of Gibson’s heritage that provoked some to anger as the Nashville-based company sought to overhaul its core products in order to reach new players in 2015. But Gibson was in the dock for other perceived wrongs, too. Some critics alleged that the company’s quality control had become patchy, while others still complained that the company’s flagship models - especially the high-end products of its Custom Shop - were prohibitively expensive or had morphed into offbeat, tech-enabled variants that offered features, such as built-in effects, that no one seemed to be asking for. Amid all the sound and fury, Gibson sold more than 170,000 guitars last year and saw sales rise by 10.5 per cent since January 2017. So with its core business seemingly firing on all cylinders, why did Gibson find itself filing for Chapter 11 this May? 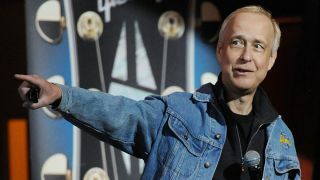 For the answer to that, we must turn to the man who was the architect of Gibson’s salvation in the 1980s and who remains at the helm of the company today: CEO Henry Juszkiewicz. Three decades into his tenure at the top, he remains an impassioned fan of Gibson’s heritage - but also a fervent believer in the power of innovation. It was this belief that prompted Gibson’s entry into the uncharted waters of consumer electronics, a move that would have more far-reaching consequences than any automatic tuning system or neck profile ever could. Given his central role in the events that have unfolded, it’s ironic that Henry Juszkiewicz’s commentary on Gibson’s guitar-making future, post-Chapter 11, has so far been muted. As you’d expect, he has been very active in making the big-picture business case that the current upheavals will leave Gibson stronger. But what kind of guitars will it make? And will it be ditching robot tuners and re-examining its pricing? We wanted to know the answers to these questions, so we did the obvious and asked if he’d talk to us about it. To our surprise, the request was granted and we were given a 30-minute slot to talk frankly with Gibson’s CEO about how we got here, what happens next and what all this means for the kind of guitars we’ll be seeing from the Nashville-based company in coming months and years. Here’s what he had to say. “Well, really, Gibson is doing well financially, and has been. I have to step back a little to really clarify what’s happening. So Gibson, as an enterprise, had a very significant division or business, if you will, that we acquired roughly three years ago - and that business had a lot of issues and trouble. We had made some strides in getting the business turned around, but we were eventually unable to do so, at least to the satisfaction of one of the banks that had financed that effort. “Clearly, there was financial stress. The music part of the business is entirely independent of those efforts in the consumer electronics business, there was very little overlap between the two businesses. The musical instrument business was doing very well, inclusive of Gibson Guitars. We had a very troubled roughly four-month period that relates to the CITES treaty that put rosewood on an endangered list and required licences, or permits, to be able to transport products containing rosewood. “That was a surprise - it had been announced that it was passed in October, roughly a year and a half ago, and was implemented as of 1 January. And the issue was that it was a surprise - there were 78, I believe, signatories to that CITES convention and those governments were not prepared to process permits. “People had to be hired, forms had to be made and 60 days for a government to implement a major programme is not really reasonable, and so it took many months for these various countries to work out their administrative mechanisms to allow the permitting process. And in that time period, we were virtually unable to export products from the US, which is a significant part of our revenue. “And so that hurt us, doubly so because we were struggling in the consumer electronics business. But that was a onetime external event. Eventually the governments caught up with the regulatory needs, people were hired, forms were implemented and the process is now working relatively smoothly. But since that bubble, the musical instrument business has been doing well. In fact we are looking for a great quarter coming up, on a financial level and market level. “So the filing for Gibson in Chapter 11 is not because the company was troubled, was somehow struggling financially - it was a case of a major part of the enterprise was struggling and we are in a process of winding that down. “The musical instrument business is very healthy, but the banking cross-collateralised the two business structures [ie made one liable for making up the losses of the other]. So there are issues on a financial level that forced us to protect ourselves from creditors, essentially, in the consumer electronics segment of the business, which is a long-winded story. “But to summarise it, the music business is very healthy, is doing well, and we are constantly improving that business and there are changes that we anticipate in making that business more sound and more healthy. The biggest improvement is going to be that, at the end of this Chapter 11 process, the debt load on the company will be severely less, so we will be well capitalised. Secondly, we will have a strong financial partner [in KKR] that gives us even more ability to access funds when opportunities arise. In terms of guitar-making, will there be any change in the direction of the designs that you’re going to launch across Gibson USA, the Custom Shop and Gibson Memphis? “As you probably know, every year we go through and craft new models, similar to the way cars would have new models and a new model year. Similar to the car business, a new model year does not mean we have a radically new approach to the market- often there are improvements, some minor, some cosmetic and it’s not completely rewriting our approach. “Gibson has a huge tradition that we have to respect, which our customers respect, so we’re not really looking at radical change. But we will be introducing the new models for Gibson starting in June, in terms of exposure to consumers, and shipments will be taking place sometime in late summer in anticipation of a generally healthy fourth quarter. “We’ve done a lot of work on those models for eight months, so it is not something that has been impacted by our financial situation, and we expect to carry through on those plans. We’ve had excellent reception from the consumers we’ve surveyed on test panels and so on, and many of the dealers have seen these new models and been very complimentary. Some people believe the best thing Gibson USA could do at this point is turn out straightforward Les Paul Standards at a reasonable price. Do you think Gibson should step back from its role as an innovator and focus more on value and heritage? I’m thinking of features such as G Force automatic tuners and so on. “Well, so I would say that value and heritage are an oxymoron, because the heritage of Gibson is not an inexpensive guitar, and it never has been. So, to be true to our heritage, going back to our founder, Orville Gibson, it is about getting the very finest in the instrument world. In fact, we have roughly a 60 per cent share of the market in instruments above $2,000 in electric guitars, and that is really what Gibson has been known for historically, so I challenge you to find inexpensive Gibsons anywhere in our history. “So if we’re going to be true to our heritage and tradition, it is about making the best instrument possible, and your statement is more about the sort of technology; I think technology is one of many parameters that could define excellence of the instrument. There are many others that are more in line with traditional [guitar-making] culture, such as the quality of the wood you use and the type of wood and the hand-processing in the factory and lacquer finishes. All of those are very expensive things that actually improve the instrument. “So I think that [during] the financial meltdown, basically, in 2007-2008 timeframe, we stopped paying as much attention to that heritage in terms of building absolutely the finest instrument and, as a consequence, prior to that period, our guitars had been appreciating at something around the order of 14 per cent to 16 per cent a year, meaning price increases. And what that means is if you bought a Gibson guitar, it is one of the few things you can buy that will appreciate in value - there is actually a hedge fund in London that bought some of the rarer guitars as a financial investment. “One of the things that is our tradition is to make Gibson an investment-grade instrument, and something that you cherish and increases in value. Were we to cheapen the product, if we tried to compete with lesser people, we would be doing the wrong thing for thousands and thousands of customers who depend on us to preserve that heritage of exclusivity and ultimate in guitar craft. “On the other hand, we have another brand that continues to be successful, the Epiphone brand, and while our ultimate Gibson guitars can be quite pricy, we have guitars in the Epiphone brand that approach $100 or £100 and are, at that price, outstanding values. Fender make guitars overseas but they keep Fender on the headstock; PRS make guitars overseas but they keep PRS on the headstock. Have you been tempted, in recent times, to consider making core-line Gibson guitars outside America? “Absolutely not. When I started in the guitar business in 1986, we were the only large factory left in the States. Fender had gone off to Japan, where everyone else was. There were smaller manufacturers at the time, but they were almost garage shop. We were the only legitimate US brand, and our predecessor company had been importing guitars from Japan under the Epiphone label. So Epiphone was the first brand that went offshore. What’s the situation with the Memphis-built semis, following announcements that the factory is to close? “Well, really, it’s a great, very successful company. We had an issue in that we had a property in which the factory was located. When we built that factory, that was a very run-down neighbourhood. Over the years that we’ve been there it’s become very trendy and very retail-oriented. So just two years ago, a major corporation put their headquarters a block away from our factory, and so the use of real estate for our factory was an inappropriate use for high-value property. And so we have sold that property [but] we are still there as we locate an alternative property in Memphis that would be more suited for manufacturing. How do you plan to attract new, younger players to Gibson guitars? “Well, really, it isn’t the Gibson brand that shares most of that load, it’s the Epiphone brand and the lesser-priced brands. When you’re first picking up an instrument, you’re not going to go out and buy the Ferrari, you don’t really know whether you’re going to take to it. So what we have to do is make instruments of a really high calibre at a very low price designed for beginning players, and we’ve done that. “And so we introduced, at Epiphone, around four years ago, the Epiphone PRO-1 acoustic guitar. Most players will start on an acoustic, and what most people had in entry level-pricing were poor representations of professional instruments. So an acoustic guitar, in order to sound really good and project, has to have fairly thick strings and has to have high tension. Now, to young fingers who haven’t developed calluses, it makes it really hard to play and painful for weeks. 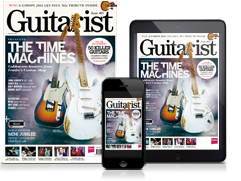 “We were the only company that recognised it - that we [the guitar industry at large] are selling inexpensive guitars that are not suitable for young players. So we did a redesign of the instrument, which allowed the playability to be close to that of an electric guitar, smooth and slinky. We designed the features to make it easier to play, maintain a low price and make it look cool, make it distinctive and something that, aesthetically, was attractive. How do you respond to accusations that quality control has been patchy at times? Is there a case to answer? And, if so, what steps are being taken to fix that? “Well, to quote some politicians, I would say that’s ‘fake news’. It’s easy for people to troll on the internet, but you’re in the media and I think you’re probably more aware than most folks about the negativity that exists and, sometimes, the lack of truth in that negativity. “So Gibson has a customer service function and it exists in the EU as well, so we have an office in the Netherlands, where we have a toll-free phone line that you can call to address any concern for any of our music brands. And so we get thousands of calls, we respond to them, it takes one minute or less from the time you dial that number. In the US, the number is 1-800-4 GIBSON, so it’s hard to not know that. You will get a person to speak to you who is an expert in guitars based in the United States, actually within a three-minute walk from my office. “That facility is functioning 24 hours a day, seven days a week, inclusive of holidays. And so if people have an issue with a Gibson, they call us, and we’ve been doing that since 1986. So we have our [finger on the pulse] of what consumers who have spent money on our products actually think, because they call us. Of the calls we get, less than seven per cent are about some kind of issue with a guitar. “But we take every one of those issues and we publish statistics on it every day, and we’ve been doing that since 1986, that’s not a new process. So we know if there are quality issues, and with handcrafted product, absolutely, we can screw up. But after many, many years, we are really good at fixing those problems and we have a policy that the customer is always right. “So I encourage you to call and see what happens, and see what kind of service level we have. I think we have an exceptional service level and, through that service level, we basically have an ongoing poll to identify problems. And there are a lot of rumours, there have been, not just recently, but I’ve seen it over the 30 years many, many times where there’ll be a flurry of hateful accusations. And most of them are unwarranted. “Some of them had a core of truth in that we would have a problem, but, if you do have a problem, Gibson stands behind that product and all you have to do is call us, or you can text us or email us and I think we’re even on Instagram now, and we respond within an hour to your communication. In light of all that’s happened, what does the future hold for you, personally, at Gibson? “I am already of retirement age, and I got something that’s one of the most frightening things in the world for someone who is ageing - I got a solicitation from the Association of Retired People. That’s always shocking, because you never feel like you’re ageing, so I’m at that point in my career normally when retirement would be in my thinking. “So no-one lives forever and there needs to be another generation to take the helm. I’ve been at Gibson for 33 years, and that’s a pretty long run. I am still going to be participating in Gibson and I’m still the CEO at this point. I will continue to aid Gibson for at least a couple more years, and my mission, really, is to pass on the knowledge and the tools to allow the next generation of management to really excel and bring the brand to a whole new level. And I would get a tremendous amount of satisfaction because I love Gibson and the brand, it’s part of my DNA at this point, and I want the company to do well.